Posted by todd under: Footwear; Raingear; Shoe covers. Posted by todd under: Cold weather riding. So yesterday it was cold, for Kentucky — down around zero — and my neighbor Kay started to worry about me. Kay and Stanley are our good friends from down the street. Kay reads to my daughter Mary twice a week. Are you going to ride in this weather, she asked yesterday. Sure, I said. You just have to dress for it. Around 7 last night, Guinever called. Stanley was wanting to come and pick me up from work. What? I said. Yes — Stanley was going to come down to where I work, at midnight, to pick me up so I wouldn’t have to ride my bike home. No, I said, Stanley’s not going to do that, but please thank them profusely for their kindness. This is when you know people love you, when they are willing to go out in the cold late at night, probably past bedtime, in the interest of saving you from the elements. God bless Kay and Stanley! Posted by todd under: Safety gear. Apparently, ANSI ranks this sort of reflective stuff by classes. 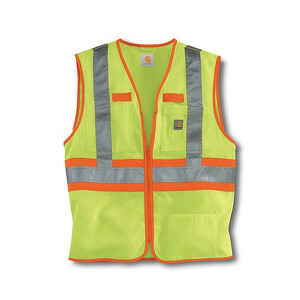 My vest (shown) is a Class 2. Even better is a Class 3, which (as far as I can tell) needs sleeves so it can offer more side visibility. G&L offers a Class 3 on their Web site, but it wasn’t in stock at the store. I like this one better because of the orange contrasting — it really seems to make the reflective pop off the already annoyingly bright yellow. 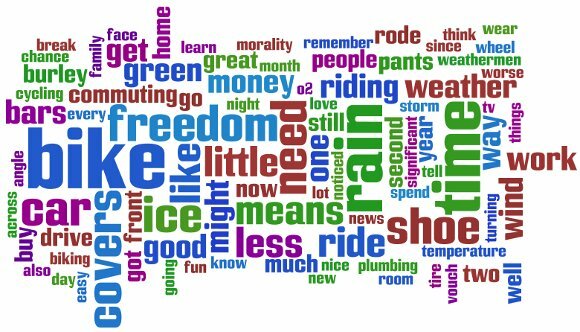 The one question mark for me is breathability — my night riding is usually the result of short (and cold!) winter days around here, so I can’t say how this will perform when the temps rise. There are mesh versions of similar vests that might be better in the summer. Posted by todd under: Uncategorized. Juan “Down” Martinez is on his way to becoming an influential figure in Latin hip hop. The 26-year-old rapper from Oxnard, California, started rapping at age 13 after listening to Straight Outta Compton by N.W.A. – and he spits with a style eerily similar to that of Eazy-E. The self-proclaimed “Brown Super Hero” proudly wears his Mexican heritage on his sleeve, flowing over corridos, mariachi music, soul and Chicano funk. In addition, Mr. “Down” apparently commutes to the studio on his … well, what is that, exactly? 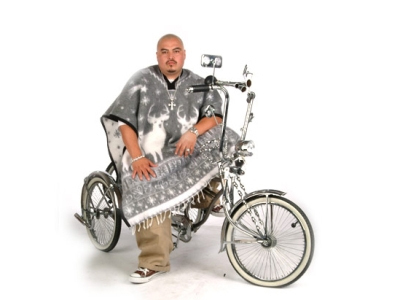 And how does he keep the Mexican heritage on his sleeve from getting caught in the spokes? Posted by todd under: Footwear. From May to Sept. I commuted 16 to 21 miles one way 3 days a week on Crocs Caymens with Rivendell Grip King pedals. I did two bike camper weekends with 50 miles a day and the same combo. It’s winter here in Va. and I’ve switched to Samba Classics….but when warm weather returns I’ll be back in the Crocs!!!! Awesome cycling shoe and only 7.8 oz. in size 13!!! Posted by todd under: Riding at night; Safety gear. Jason Nunemaker over at The Cycle offers a great tip on a reflective vest he’s wearing for commuting. It looks like this thing takes “high visibility” to new heights. Anyway, Jason’s recommending a Carhartt vest designed for construction workers. Check it out on Carhartt’s site; Jason got his here. From a brief scan, it looks like the vest is retailing for around $35. Posted by todd under: Recommended reading. Posted by todd under: Crashes; Philosophy; Riding. I rode my bike home from work last night in a rain storm that was turning into an ice storm, despite dire warnings from the TV weathermen. It wasn’t dangerous out there, or even particularly unpleasant — and this very possibly will have been one of the worst nights of the year to ride. I don’t ride a bike to work every day because I buy all that nonsense about carbon footprints. I don’t think global warming is man-made, and I think Al Gore is a glutenous gasbag. Thanks to the green movement, there is a certain tight-lipped puritanism and a cloud of fake morality about bicycle commuting these days. I ride a bike because it’s fun (more about that later) but mainly because it saves money. Lots of it. Saving money means saving time. Time saved means freedom — freedom to spend more time with my family, to work on church stuff, to remodel the garage, to write on here a little. If I weren’t riding my bike, my family would need a second car. That means either a car payment (we don’t have one now) or shelling out $5,000 or so for something dependable. There would be, what, 50 bucks a month or so for insurance. That second car would need gas, oil changes and tires. It would need to be washed and vacuumed now and then. That’s a lot of money, which means a lot of time, because it takes time to earn the money. There are less tangible savings as well. Since our driveway runs through our back yard, there would be another car parked out there — less room for the kids to play. Then there’s the fact that I don’t have a gym membership. Without bike riding, I would need to get one, find time for another form of exercise (there’s that time angle again! ), or go to seed (more than I am now). You can get a fantastic commuting bike and all the gear you would need for $2,000 or less — much less, if you get a good used bike. That’s it for your costs, until you need a new tire ($20) or a tuneup once a year or so (around $50) — although I recommend you buy a few tools and learn how to do the tuneups yourself. For less than $2,000 you could very well be getting freedom from a second car. That’s significant. You might also be gaining freedom from gaining weight. That’s significant also. It’s expensive to buy new clothes every 6 months to a year, as your waistline expands. I consider the fun of cycling to be a bonus (since I would probably be doing it anyway). I love it, plain and simple. It’s a great stress-reliever. I like the self-sufficiency. I like the wind and sun on my face. I like having to pay attention to the weather and figuring out what to wear. I realize not everyone lives within biking distance, and that biking might or might not be practical for most people. If you ARE thinking about cycle commuting, or if you’re trying to remember why you are doing it, forget about the environmentalist noise. Fake morality keeps most people going for maybe a week. 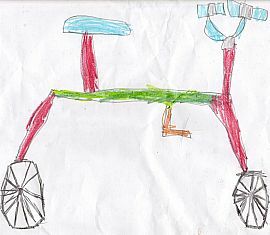 From years of personal experience, I can tell you: Lasting motivation comes from remembering that cycling means freedom. And fun. Posted by todd under: Crashes; Raleigh Super Course. Posted by todd under: Burley shoe covers; Footwear; Raingear. UPDATED Dec. 10, 2009: These covers are no longer available from this seller, and I can’t find another source for them. I did find a similar looking cover from Showers Pass. I can’t vouch for them, having never used them, but here’s someone else’s review. Hey, this is nice news. I’ve told you how much I love my Burley shoe covers — they are still keeping out rain after a couple of years of everyday-commuting use. I can’t vouch for the seller, but I CAN vouch for the shoe covers! If there are more good sources out there for this great product, please let me know and I will pass them along.